Edesix, UK-based market leaders in the provision of body worn camera solutions, is now the no.1 body worn camera provider in the UK for fire services. 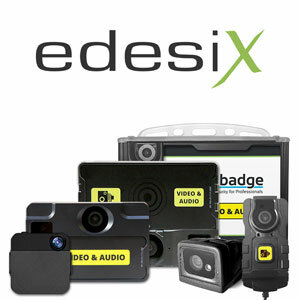 Edesix recently won the contract to supply body worn cameras to Staffordshire Fire and Rescue. The Edinburgh-based BWC expert already works with West Midlands Fire Service, as well as other Emergency Services departments throughout the UK. The use of Body Worn Cameras for protecting staff, enhancing training and identifying best practice is fast becoming fundamental within fire services throughout the UK. Wearable cameras are becoming a key piece of equipment for fire services due to their functionality in highlighting and improving processes, evaluating protocol, improving best practice and also for handling matters of incidents, insurance claims and complaints. In 2016 Edesix became one of the first BWC providers to supply fire services in the UK when it won the contract to supply fire-fighters in the West Midlands with VideoBadges. Watch Commanders attending call outs throughout the West Midlands are now equipped with VideoBadges to help share best practice techniques and complement firefighter training, ultimately improving the service’s operations well into the future. For more information visit https://www.edesix.com/industry-solutions/fire-service. Edesix will be exhibiting this years Emergency Services Show, where there will a specific focus on the use of wearable cameras within the Fire Services industry. To meet Edesix at the event, please email sales@edesix.com.